British citizens have been warned to brace for the arrival of another 9 million Muslim migrants, which will more than triple the current Muslim population of Britain from 4.1m to 13m. According to projections from the Pew Research Centre, the number of Muslims in Britain is set to continue on an upward curve, hitting 13m in 2050. Under the model, which assumes median migration levels, Britain will have the highest percentage of Muslims in Europe. It said the research followed a “record influx of asylum seekers fleeing conflicts in Syria and other predominantly Muslim countries”. Telegraph reports: The UK also has one of the largest gaps in fertility rates between Muslims and non-Muslims, with Muslim women having an average of 2.9 children compared to the 1.8 had by non-Muslims. This means that even if migration were to stop completely, the group’s population share would rise by more than 3 per cent in the UK, as well as in France, Italy, and Belgium. 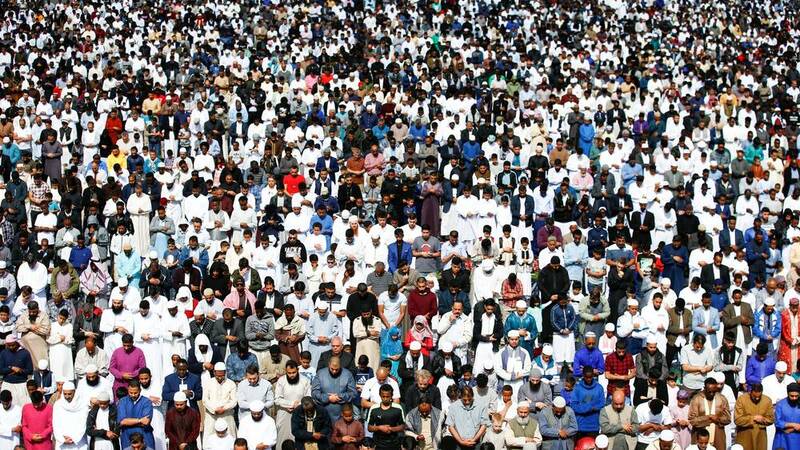 Muslims in Birmingham, Britain’s second city, celebrate Eid al-Adha one of the holiest days in the Islamic calendar. The paper suggests that if migration continues at the same rate but refugee movement stops, the UK will have the highest overall population of Muslims in the EU, at 13m, making up 16.7 per cent of the population. Currently the country is behind Germany and France in overall population of Muslims. “Relatively few recent immigrants to the UK (60,000) were refugees, but more than 1.5 million regular migrants arrived there in recent years. “Overall, an estimated 43 per cent of all migrants to the UK between mid-2010 and mid-2016 were Muslims,” the paper said. The study also shows that the UK has one of the lower levels of hostility toward refugees from Iraq and Syria. Just over one in three people see them as a major threat, compared to 39 per cent in France, 42 per cent in Spain and 60 per cent in Poland. It concluded that people in countries with lower overall numbers of refugees were more likely to believe they were a threat. According to figures from the Oxford-based Migration Observatory, one in five non-UK born people in the UK is Muslim.